Pixy Camera. What is a smart camera? 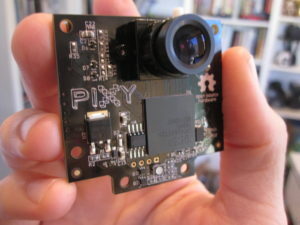 The Pixy Camera (CMUcam5) is a smart camera created by CharmedLabs financed through a kickstarter campaign during the year 2013. It is the fifth generation of a series of cameras oriented to the scientific and industrial field. Smart cameras are cameras that in addition to recording images or video, produce scene information through one of its communication ports. SPI -protocol by default, uses 3 cables. UART – 2 Cables, common serial port. RX and TX. Analog – 1 Cable. Servo signal of the largest object object detected as an analog voltage between 0 and 3.3 V.
This allows us to easily incorporate artificial vision into our hardware projects without the need for a computer, with libraries available for Arduino, Raspberry Pi and BeagleBone Black. The camera configuration software is cross-platform and supports Windows, OS X, and Linux. 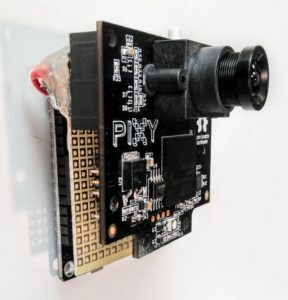 It is a platform of artificial vision very easy to use, with the firmware that is installed by default, you push a button and Pixy will do the tracking of that object. Image Sensor: 1280×800 Omnivision OV9715, 1/4 “. Processor: NXP LPC4330, 204 MHz, dual core. The best thing of all is that this camera is 100% Open Hardware, its schematic and firmware are available freely on the Internet, which has allowed the emergence of projects derived from this hardware, such as IR-Lock, the precision landing system for Solo drone of 3DRobotics. In Aeracoop we use it to do three-dimensional tracking of the drones in the Open Light Motion project. We use two cameras connected to a network that determines the position x, y, z in space. We work for the resolution of social problems through the empowerment of airspace. We help organizations with R&D to generate projects using unmanned aerial vehicles.